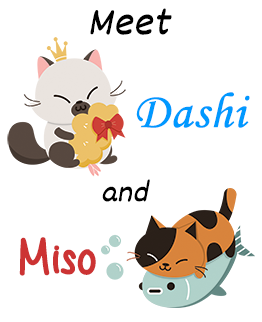 Meet Dashi and Miso – Love At First Bento’s adorable kitty mascots! 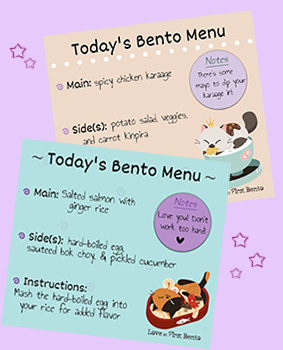 Designed by the phenomenal Rosey Cheekes, these two kitties would love to help you build your next bento box! Read their bios below to learn more. 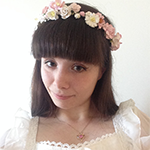 Dashi believes she is a feline princess, and as such prefers to be addressed as “Princess Dashi”. 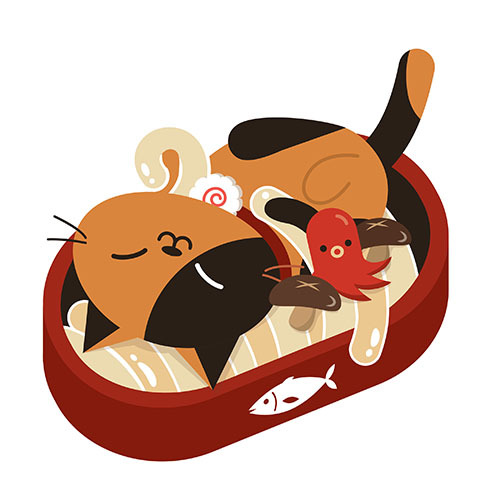 Favorite Food: Bonito flakes & tuna. Dashi vastly prefers having her food served to her in china dishes, as well as for the food to be slightly warmed. A sprinkling of bonito flakes atop her food is a treat she can’t get enough of. She will often, unknowingly, have bonito flakes stuck to the fur around her mouth and nose after licking her dish clean. Favorite Toy: Catnip pillows, laser pointers. 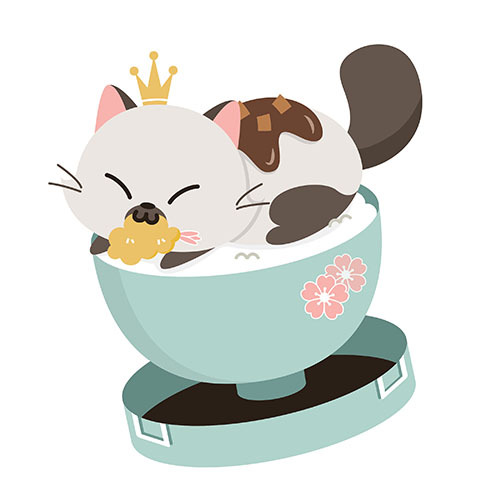 Anything containing catnip will have Dashi acting like a very mischievous princess in no time. She is also (secretly) very fond of chasing around laser pointers. Whenever his owner is cutting or preparing chicken or salmon, Miso will not leave her side. Miso is very playful – he will play with just about anything! He loves to chase around Dashi, and will try to play with her (whether she wants to or not). Dashi and Miso are named after staple Japanese ingredients that can be found in any Japanese kitchen. When combined, they create miso soup, one of Japan’s most popular dishes. Dashi is a fish stock that, classically, is made from konbu (dried kelp) and katsuoboshi (bonito flakes). It is a pivotal ingredient in Japanese cooking, and acts as the foundation for many popular dishes, such as miso soup and chawanmushi (egg custard). Miso is a fermented soybean paste, and is used to make miso soup and miso-flavored ramen. It comes in two main varieties: red and white. Red miso pastes tend to be saltier and more potently flavored, whereas white miso pastes are milder and less salty. PS: Can’t get enough Dashi and Miso? 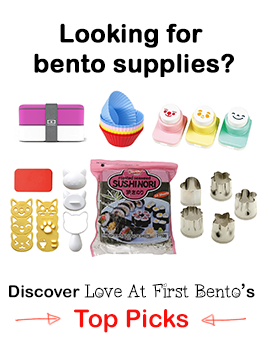 You’ll find them featured on the Love At First Bento bento menu cards, which you can get for free by subscribing here.